This is the story behind the artwork used on The Fluffy Jackets debut album. I have always been a fan of the swords and sorcery type paintings that you see on so many classic 1970s album covers. It seems to me that a lot more effort went into making album covers back then, as LP covers would be displayed in shop windows etc. Today, in the digital download era, the cover is only a small thumbnail you see when shopping on Amazon or iTunes. Even if you buy a CD in a shop, it is much smaller than an LP used to be, so naturally, less effort goes into it. However, I wanted to commission a large scale painting for the Fluffy Jackets cover, and initially approached John Howe, the illustrator behind The Lord of The Rings film-trilogy and the Hobbit movie. He answered in the positive, and it was always our intention that he should do it. And it would be great if he had, because it would be his first ever album cover. But, alas, he got too busy with other projects and we just could not make it happen in time for the album release. But, during a holiday in Thailand with my family, I stumbled upon a art-gallery where a little lady was sitting drawing pictures of some amazing dragons. 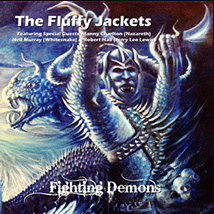 At the time, I was working on the title-track “Fighting Demons”, and I couldn’t help thinking that it would be perfect to have a demon fighting dragons on the cover. In other words, the album cover artwork is more of a reference to the song lyrics in "Fighting Demons" than it is to the music on the album as a whole. 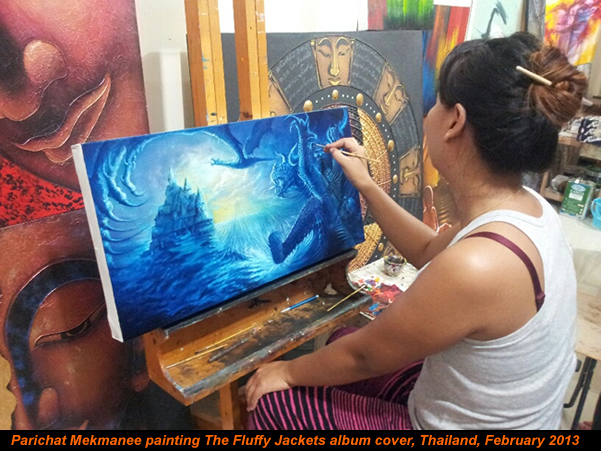 In any case,, after a quick chat to Parichat Mekmanee, the painter, the job was underway. It is painted in an LP gatefold size. On the back, the painting feature a building which is based on Heddal stave church in Norway, which I thought was a nice Scandinavian connection.